Throughout the industry, auto insurance rates are increasing to keep up with higher claim losses. Low gas prices, distracted driving, high medical costs, and car technology contribute to the increase. Make sure to schedule an insurance review to ensure you are taking advantage of all discounts. And have you downloaded the Drivewise app for safe driving rewards? Join us at Mustang Sally Brewing Company on Friday September 16th from 3PM to 10PM to help raise money for Ellie’s Hats. 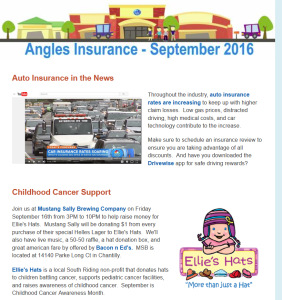 Mustang Sally will be donating $1 from every purchase of their special Helles Lager to Ellie’s Hats. We’ll also have live music, a 50-50 raffle, a hat donation box, and great american fare by offered by Bacon n Ed’s. MSB is located at 14140 Parke Long Ct in Chantilly. Ellie’s Hats is a local South Riding non-profit that donates hats to children battling cancer, supports pediatric cancer facilities, and raises awareness of childhood cancer. September is Childhood Cancer Awareness Month. You can prepare for the back-to-school driving season by following a few simple safety tips. Look Out for New Drivers. When driving (especially near high school campuses), keep in mind that a higher number of motorists you encounter may be teens hitting the road for the first time. Most accidents can be avoided if just one party is paying close attention. We’re proud (and thankful!) that our clients brag about our agency to their family and friends. We are happy to send you a $10 gift card for every referral and enter your name into a raffle. Congratulations to Mr. B. for winning a flat screen TV in June. Our next raffle is December 1st for a $250 gift card for holiday shopping. And thank you to all our clients that have posted reviews for us on our Chantilly facebook, google+ and yelp pages and our Manassas facebook, google+ and yelp pages!